When choosing your new hedge a lot of people go for bare root. There is a little risk when choosing this option as they are dug out of the field in the dormant season from November through to February. As long as you take all the precautions and do your best you might not even lose any. As soon as you have received your delivery it is important to get them planted as soon as possible. Give them a good soaking at the the base every day. If they are not planted make sure the roots do not dry out. Once planted you should ensure the plant is not going to rock in the wind. If this is the case make sure it is securley staked with a cane and a suitable tie. As with all new planting water in as soon as they are planted and keep them well watered in dry times for the first growing season. Come next year and the plants are establishing in the ground, we do suggest you keep away any unwated grass and weed from the new planst as this can take away moisture and food. Empathy Rootgrow Mycorrhizal Fungi with Gel. It is specially designed for bare roots, it encourages the secondary root system to develop which is what they need to support themselves for their lifetime. 1. Take a large bucket and fill with 4L of water. 2. Sprinkle the contents of the gel powder sachet into the water and stir well. 4. Dip the plant roots into the solution ensuring even coverage. When planting a new hedge, root ball is a great option. 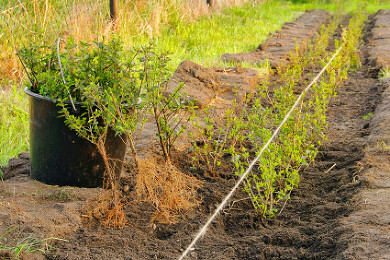 Root balled hedging is a great way to get large hedging plants for less of an outlay. They are dug from the fields where they grow much fatter than grown in containers. Root balls are dug from November but you can order them now. Growers we will advise you on the optimum timing of the digging. You can trust us and we can work together to get you the best chance possible for success. If the Balls can not be dug and dispatched within a few days, as a further insurance they don't dry out, we pot them into compost to keep the balls nice and damp. Keep the sacking on them as the roots will grow through it and the sacking is biodegradable. Dig the whole like normal, making sure the soil is nice and loose, so the water can drain through. Place the plant in the hole making sure it is upright, placing the root ball, so it is level with the ground - not too low and not too high - back fill with the compost firming it down. Once planted you should ensure the plant is not going to rock in the wind, if this is going to happen then you should secure the plant with a stake and a suitable tie. We know supply the Empathy Rootgrow Mycorrhizal Fungi, this is excellent and is also recommended by the RHS. It can be used once the hole has been dug and you are about to put the Root Ball plants into the ground. Its a good way to help the plants get off to the best start possible.